This airticle is aboot the ceety. For the emirate, see Abu Dhabi (emirate). Abu Dhabi (Arabic: أبو ظبي‎ Abū ẓabī, literally Faither o deer) is the caipital an the seicont lairgest ceety in the Unitit Arab Emirates. 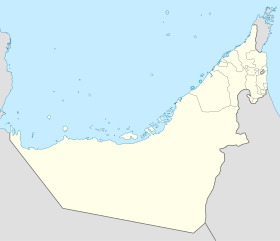 Abu Dhabi lies on a T-shaped island juttin intae the Persian Gulf frae the central wastren coast. The ceety proper haed an estimatit population o 896,751 in 2009. Abu Dhabi hooses important offices o the federal govrenment, an is the seat for the United Arab Emirates Govrenment an the hame for the Abu Dhabi Emiri Family an the Preses o the UAE frae this family. Abu Dhabi haes grown tae be a cosmopolitan metropolis. Its rapid development an urbanisation, coupled wi the relatively heich average income o its population, haes transformed Abu Dhabi tae a lairger an advanced metropolis. The day the ceety is the kintra's centre o poleetical, industrial activities, an a major cultural, an commercial centre due tae its poseetion as the caipital. Abu Dhabi alane generatit 56.7% o the GDP o the Unitit Arab Emirates in 2008. Abu Dhabi is hame te important financial institutions sic as the Abu Dhabi Securities Exchange, the Central Bank o the Unitit Arab Emirates an the corporate heidquarters o mony companies an numerous multinaitional corporations. Ane o the warld's lairgest producers o ile, Abu Dhabi haes actively attemptit tae diversify its economy in recent years throu investments in financial services an tourism. Abu Dhabi is the seicont maist expensive ceety for expatriate employees in the region, an 50t maist expensive ceety in the warld. Fortune & CNN statit that Abu Dhabi is the richest ceety in the warld, . ↑ "The secret lives of names". Gulf News. 2007-03-08. Retrieved 2008-08-23. ↑ "Cost of living — The world's most expensive cities". City Mayors. Retrieved 2010-08-14.